If you're going to be applying for this game, please let us know - otherwise, if it looks like the applications have stopped rolling in or being updated, I'll go ahead up push up the 'first pick' date. Please let me know if anyone has questions - I'm happy to help!! I was born in darkness, deep beneath the ocean many leagues south of the Dragon Sea. My father's blood carried that darkness in it and I felt the chill of my power keenly as a child. 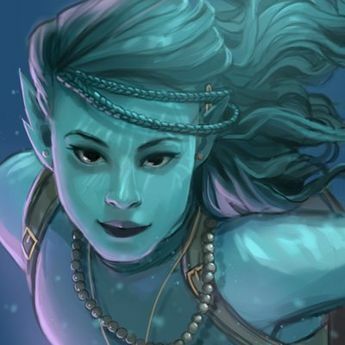 My mother was a warrior, the first to battle against the sahuagin and kraken, and her force of presence forged her into a respected leader before I was even a twinkle in her eye. Our protectorate spanned vast coral reefs and deep trenches that I spent much of my youth exploring. That sense of uncovering something new, if only to me, always made my heart flutter in my chest. My father often accompanied me and used the opportunities to tutor me in how to connect with the depths in ways only our kind could. I was always a quick study, if often distracted, but I never saw my father happier than when I'd use our shared powers to bring down a threat to our people. His illness came quick and cut me deep, watching him wither and suffer until he was shell of a man. No one could find a cause or a cure, and in the end his death was a mercy to everyone involved. I took his brand on the night that they released his body into the Ever Deep, marking my commitment to his teachings across my heart and taking his place as the protectorate's Mystic of the Depths. Some said I was too young, too irresponsible. None more loudly than me. In times ancient and dark, when my people first came to battle the creatures we allowed into the Prime, they established a protectorate called Yurelis in what is now known as the Great Sea. A fortress city designed to defend the land beyond it from aquatic threats. The story goes that after the battles were won the city rose above the sea during a great earthquake and the humans who lived nearby raided and claimed it for themselves, driving our people back into the ocean. It was unbelievable to us, then, when stories came from scouts to the north claiming that Yurelis had sunk once more. My mother gathered a squadron to investigate the rumors of the return of Nu Yurelis and I begged her to take me. If my father's illness had lingered even months longer she would have never allowed it, but without his magics to aid her I was the next best option. I've never had an issue with being someone's second choice as long as it ends with me getting what I want. Our group was small but skilled, the better to move quickly in case sahuagin tribes were moving to claim the keep before us. Nu Yurelis was always my mother's dream. Her great-great-great grandfather was a founder and our family has never let the wound of its loss heal. I've listened to the stories but I could never understand the pain on her face over something she'd never seen. When I saw it, though...I get it now. It may be broken stone and bone dust now but I can see what it once was. Beautiful, lasting, a bastion. The buildings added and adjusted by the landwalkers didn't survive the return to the depths; they don't understand how to build for below like we do, so dependant on wood and soft stones. But the central structures, built generations ago, still stand and I've been handed the responsibility to reclaim it. I know my mother wasn't happy at the decision but her experience is needed in the depths, not this close to the surface where the threats are lesser. I question myself every day, but I've been left with capable advisors and loyal skirmishers to aid me. My father's faith in me is a bolster in the darkest times, and I hear his voice often. I know many of my people don't trust those from the surface. Old grudges die harder than an aboleth and there are many grudges to be addressed. But old guilt burns just as hot and my people have a responsibility to address the dangers we have allowed into this world. And personally, landwalkers fascinate me. I know the line among my people is that we're stronger, more capable, more dedicated but there is something beautiful in the softness of the elves and humans and smallfolk of the surface. The way their minds work, the things they create and the lives they live, are so unlike the functional nature of our own creations. There is a beauty to triton design but it is always utilitarian whereas on the surface they often make beautiful things for the sake of the beauty. Gold and gems don't glitter where the sun cannot reach but I find them beautiful just the same. I realized right away that a little beauty might be exactly what Nu Yurelis needs, so I made the order to reclaim the only piece of the city still above the waves. The Beacon of the Lost was once an outpost and memorial, dedicated to those taken during our people's first wars in the Prime, but the humans converted it into a lighthouse centuries ago. My people have consecrated the tower again but I thought it best to keep the lighthouse aspect for easy navigation. Several small buildings have been reconstructed around it to serve as lodgings and trade houses for the landfolk. My father told me that threats come from above and below and anywhere in between. While that's physically true in the depths, it's figuratively true even on the surface. We will be facing enemies that we don't even know we have and I've encouraged diplomacy among the cultures on the surface. This place, called the Forgotten Lands by some, is home to strange and varied people many of whom could serve as capable allies against the troubles to come. I hope to be cautious, as I'm told some could hold grudges about the loss of Yurelis much the way my own people did, but I have faith in the goodness of folk both above and below the sea. Warcry: Froth the waves, churn the sea! Specifics I haven't gone through the Strongholds and Followers book thoroughly so I'm not sure how best to handle Nu Yurelis. If the underwater aspect of the Keep isn't something that works in the overall story I could focus on the trading post around the Beacon as an Establishment. Crunch Starting stats: 11+1, 10, 13+1, 13, 8, 14+1. Last edited by PopCultureBard; 04-17-2019 at 12:44 PM. Fantastic job... I've updated your status to COMPLETED! After selection we can talk about the Tower vs. Temple since this is a Cleric of the Arcane. I'm glad you were able to bring one of your favorite characters back! Thank you for the application - it looks wonderful. I've marked your application COMPLETED! I'm encouraging everyone to continue to tweak, add/subtract, whatever you like, to your characters and application all the way up to first pick day. Last edited by savoylen; 04-15-2019 at 11:16 PM. I didn't see what you wanted to use for the Sigil so I dropped in a place holder for now - when you decide, just update your app and I'll catch it on the review. You might consider the Triton (merperson) - I know, a bit on the nose so to speak, but there are a lot of options. I thought the white Piles on a blue background would be a good place-holder because it is simple (a sub ordinary) and would look like light coming up out of the sea. Having a "tower" like this is no problem - its actually a very cool idea. We can place it were ever you like - land or sea, its really your call. The system (with whatever mods we decide on) can handle whatever you can imagine and would like to play. I've marked your application COMPLETED!! Feel free to make and additions and updates you like all the way up to selection day. Last edited by savoylen; 04-15-2019 at 11:35 PM. Pale skinned, dark haired human in her late teens. Given a choice, she would prefer very dark clothes. Plain, working clothes. When faced with danger, she wears leather armor. Ritter's parents operated a shop in the merchants district of Snubba. They specialized in creating document, maps, etc. She learned the skills of a scribe at a young age. Ritter's great-aunt Rai (her mother's mother's sister) was an odd woman who lived by herself out in the forest. She practiced magic, and was generally shunned by common people. But Ritter loved her. Ritter's parents were murdered a year or so ago. Perhaps in a botched robbery by Brogan Clearmist's gang. With no where else to turn, she sought out her aunt Rai for help. "I'm going to introduce you to someone who has been a great help to me in my life. She will get you through this." said Rai. Aunt Rai laid her hand on Ritter's forehead, and Ritter saw a vision of an aged women in a silver gown. The lady said to her "I will come to you in your dreams, as a teacher. Your aunt and many along your mother's line have been my students for many years. I will give you the tools you need to survive this trial"
Living in the forest with Aunt Rai was not really to Ritter's liking. She has recently returned to Snubba, seeking a livelyhood adventuring with what she has learned from Rai and the Silvered Lady. During her year in the forest she learned to move objects with her mind. She learned to inflict damage by attacking with frightening whispers. And most importantly, she learned to defend herself with a blast of magical energy. Just a half day before, Ritter had bid a tearful farewell to her beloved Aunt Rai. For months they had talked about her returning to Snubba. Ritter was unhappy with the isolated life her aunt led in the forest. She wanted to return home. Finally the day had come. Rai told Ritter to watch the old trail. Travellers and hunters used this route if they needed to reach Snubba through the forest. She was to watch for safe-looking travellers and follow them back to the city. This would be safer than travelling alone. And she had done exactly that. Three hunters, two human men, and a boy. Probably a son to one of them. On a hunt deep in the woods for some sort of large game. They must have failed in their hunt, because they appeared to be empty handed. The travellers tired before Ritter, and they began to bed down with a campfire off the trail. She stayed out of site, but found a safe place where she might get some sleep within earshot of the men. She dozed off. And it the dead of night she was awaked. She looked to the campfire. She could see shadows moving across the flames in the distance. She ran to see what was there. By the time she reached the edge of the camp, the hunters had killed two goblins. But one of the humans was wounded badly. The largest goblin had grabbed the boy. He shouted in the common tongue "Give it up humans. We have your child. Give us everything you have, or the boy dies!" The hunters were frozen in fear. Not knowing what to do. Surely the golins would kill them no matter what ransom they gave. Ritter remembered what she had learned from Rai. She drew upon the power of the Silvered Lady, closed her eyes, and with her will created a song of fear in the mind of the big goblin. His face grew grim, he released the boy and began to run. As the goblin ran, the hunters sprang to attack. Ritter entered the clearing, and fired a bolt of purple energy at one of the remaining goblins. Casts eldritch blast. Hits a goblin for 8 damage. Killing it. As the tide of the battle turned, the goblins ran. Ritter stood before the hunters. "We don't know who you are girl, but you saved our hides!" Ritter wasn't sure what to say. "Its nothing. Just glad I could help." She camped with the hunters until dawn, and then travelled with them to Snubba the next day. After a year away, she was back in her home town, and looking for a way to make use of what Rai and the Silvered Lady had tought her. Perhaps she might even find the bandits who had killed her parents. Ritter set about a life of adventuring for a period of time. She used the power of the Silvered Lady to help those in need and bring about justice when she could. She learned quickly, and as a reward for her success, the Lady would come to her in her dreams occasionally. In these dreams, Ritter often learned new abilities - which she could use in her waking life. "Ritter, you have done quite well. I am pleased with your progress. You can now clearly stand on your own." "If you wish to continue to receive my aid, I must ask for something in return." "As you know I have other students, going back many years. One of these students in particular has become quite old. Her name is Sen Bask and she lives still. But she is not long for this world. I would ask that you go to her, and care for her in her final days." "But there's more. This woman owns land. She has a Keep on the wild border, with a tower. The place is known as Aralan Tower, although no one alive today knows the meaning of that name. " "Aralan Tower is an important place to many people. It provides protection for those living along the border. It provides a location for trade, and protection from war. " "If you accept my offer, you will become the Viceroy of Aralan Tower. You will govern it on behalf of Sen Bask, until her passing. You may even inherit it." "Ritter, will you take on this task?" Ritter replied: "Of course I will do this My Lady. You are the wisest and most just. I will care for Sen Bask in her remaining days, and I will learn to govern Aralan Tower with your guidance. " *note my original DM allowed variant human, and allowed an extra feat at first level. Those things are reflected in the character sheet I have as of now. I will remove them if required. 1 Warlock Patron: Great Old One "The Silvered Lady"
note: - "observant" feat gives +5 to passive int and wis checks. Last edited by Stadiumite; Yesterday at 05:48 PM. I'll finish my app tonight! I am definitely still interested in this game! I'll be finished tonight or tomorrow. Added a character sheet for Roem, complete with equipment and money left over. Now I will just sit back and watch nervously as one excellent application after another pops up. Savolyen: I'm looking to put an application -- just found the ad two days ago, and it looks great! I shouldn't need the full ten days, so feel free to move the date up a little bit -- I was aiming to finish up over the weekend, but I could probably do it in a few days if needed. Savy: I think Zang might be done. Could you let me know if there's anything missing or that you'd like me to expand on? Thanks! Thanks, Savoy. I started working on the app back when I rolled the stats but then I got distracted reading all the threads in Descent. The sigil has been by far the hardest thing to nail down. I think a triton sigil would be perfect given the race's tendency toward arrogance and their belief that they alone can hold back the tide but I haven't found one in the creators. I may end up with something a little more color and shape than actual imagery. It'll be up before you start your selections. I'm very intrigued to see how this game plays out. Last edited by PopCultureBard; 04-16-2019 at 02:25 PM. I think Valerie is done, I'll make up a sheet if I get accepted. If there is anything I forgot to do, let me know! My application is complete, I think. Please let me know if you need more info. I have a character from another game that has just dissolved. I'd like to move her into this campaign if there is still an opening. For now I am re-posting what I wrote for that original game. I will update it to meet the requirements soon. Am I too late? I love we are finding new homes for some of these beloved characters! and welcome Stadiumite!